Originally invented by the Shaker community in the 1700s, clothespins are incredibly useful for hanging wet clothing on a clothesline, but also can be used to organize your cable cords, keep your pair of socks together, hold down the used end of your toothpaste tube, and decrease the possibility of you accidentally hammering your finger while pounding down on a nail. To make a simple clothespin vase, pinch clothespins along the circumference of an empty and cleaned-out tuna can. The "vase" can then be used as a candle holder or a container for a small potted plant. To transform your simple wire coat hanger into a more functional hanger, use clothespins on both ends of the bottom rung to hang skirts and scarves. 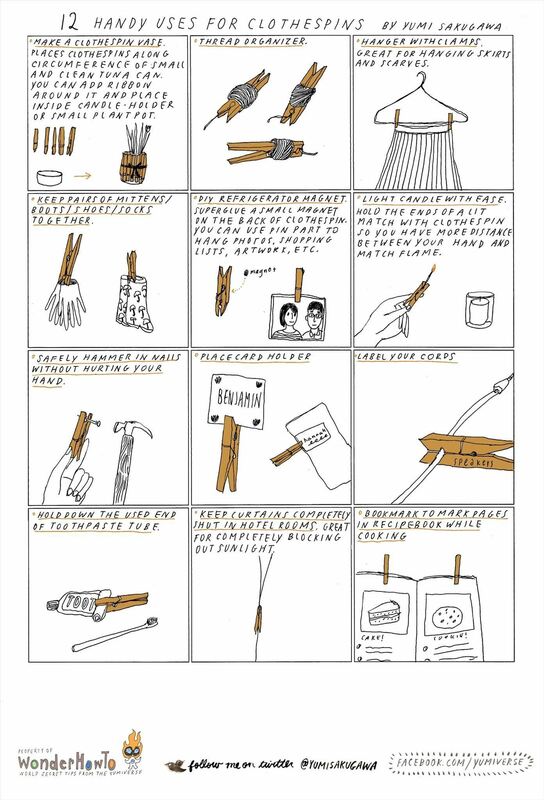 Got your own nifty uses for clothespins? Share with us! How To: Making the JUMBO ''Toothpick'' Shooter !